Homemade noodles are easier to make than you may think; they're just flour, eggs, and salt. 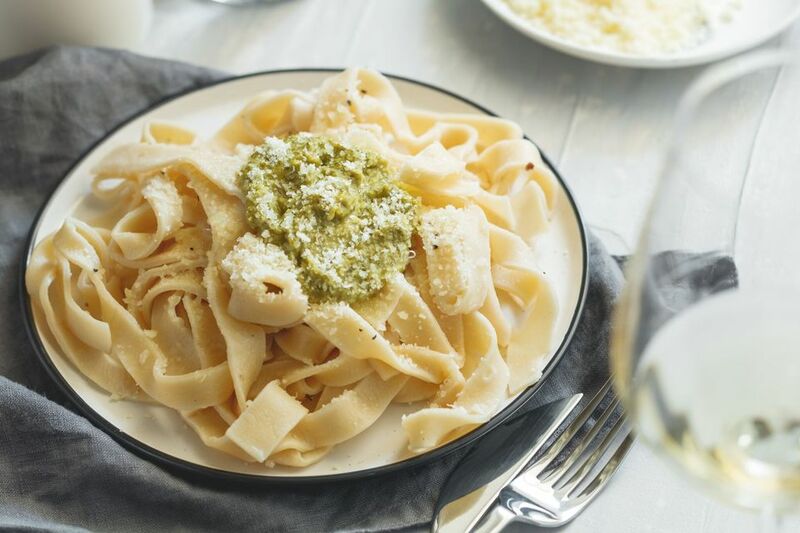 If you've tried making Italian homemade pasta before, but weren't thrilled with the process or the results, know that these egg noodles are much simpler. Especially since you don't have to roll the dough out as thinly as you would for Italian-style pasta. Combine the flour and salt in a large shallow bowl or on a clean work surface. Make a well in the center, almost like a "bowl" of flour to hold the eggs, and crack the eggs into it. Use a fork to beat the eggs and then gradually start incorporating the flour into the eggs (as you beat them, they will slowly but surely take up some flour from along the edge of where the eggs meet the flour). Keep stirring and pulling in more flour until a solid dough forms. The dough will be sticky. Don't worry, you'll be working in more flour in a moment. Too much flour now and the extra flour needed to roll out the noodles will lead to an oddly dry, rather than tender, noodle in the end. Turn the dough out onto a well-floured work surface. With well-floured hands, knead the dough, incorporating more flour as necessary to keep it from sticking to either the work surface or your hands, until the dough is smooth and firm and no longer sticky. This takes 5 to 10 minutes for most people. Wrap the dough with plastic wrap and chill it for at least 30 minutes and up to overnight. Divide the dough into 2 pieces and work with one half of the dough at a time. On a well-floured surface roll out the dough to the desired thickness (anywhere from 1/4-inch to paper thin—the call is yours!). Be sure to rotate, or otherwise move the dough, between each pass of the rolling pin to keep the dough from sticking to the work surface underneath. Sprinkle everything with flour—including lifting the dough and flouring the work surface again—as necessary to keep the dough from sticking. Use a sharp knife or pizza cutting wheel to cut the noodles. You can make then as narrow or wide as you like but cut them as evenly as possible to ensure uniform cooking time. Lay the noodles on a cooling or drying rack and let them sit until ready to cook. Repeat rolling and cutting with the remaining half of the dough. Boil the noodles in well-salted water until tender to the bite. Drain and serve with butter or cheese, with stews, or in soups. You can let these uncooked noodles air-dry until completely dry and store them in an air-tight container at room temperature for up to a month. You may be tempted to store the uncooked noodles in the fridge in an effort to keep them "fresh." Avoid this temptation. It's strange, but true that they keep much better dried than they do in the refrigerator, where they will get soggy. If you have a pasta roller, you can use that instead of a rolling pin, when rolling out the dough, if you like. This will lead to more evenly formed noodles. Wondering what to do with them? If nothing else, try them in Chicken Noodle Soup.